A childhood fascination with archaeology and a chance encounter with a 2,700-year-old Egyptian mummy are helping Vermont doctors and law enforcement officials find truth in some of the most challenging of modern-day crimes: the unexplained deaths of young children. 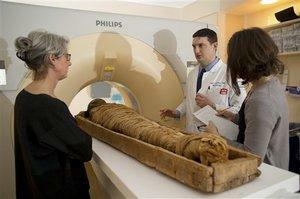 After spotting the mummy at the University of Vermont's Robert Hull Fleming Museum in Burlington, Dr. Jason Johnson, a radiology resident, arranged to have it put through his hospital's state-of-the-art CT scanner. He wanted to know about the life of what is believed to be the remains of an Egyptian servant girl of about 14 — and what led to her death. What Johnson didn't expect was that some of the scientific techniques used to reveal the mummy's secrets would have other applications, including helping Vermont's medical examiner and prosecutors determine if children who die in infancy are the victims of crimes. The hospital's CT scans helped doctors create a full-size, three-dimensional model of the mummy's skull — thanks to the latest technology and the sharp detail obtained by cranking up the power on the scanner to levels unsafe for living patients. That also helps in forensics by revealing patterns of injury in modern infant death cases that other scan techniques might miss. "It made me feel good I came up with the protocol to work on the mummy," said Johnson, 31, a fifth-year radiology resident at Fletcher Allen Health Care, the teaching hospital at the University of Vermont. "I never sat up at night thinking, 'How can I save children from abuse?'" Since the mummy was scanned in November, physicians working with the Vermont medical examiner's office have started using the techniques on infant deaths, which average about one a month. "It was tremendously helpful," said Washington County State's Attorney Tom Kelly, who used the information gleaned from a CT in a recent case to help determine the age of the bone breaks in a young abuse victim. The case, completed before the mummy technique was developed, has not been discussed in open court so he couldn't give further details. Johnson said that just as important as helping officials learn if a crime has been committed, the new techniques can help prove an infant's death was natural. "It's not always pattern of injuries that we find suggesting somebody did something wrong," Johnson said. "There could be findings that nothing wrong happened or the story fits. It's in the interest of truth." Medical examiners across the country are turning more to CT scanners to complement traditional autopsies and X-rays, said Dr. Mary Ann Sens, the president of the National Association of Medical Examiners and chair of the pathology department at the University of North Dakota's medical school. And now it's being expanded to deceased children. Vermont's chief medical examiner, Dr. Steven Shapiro, said he's been doing full-body CT scans of infants for two or three years. The new techniques developed for the mummy scan are just improving the process. "Since the person is not living, you don't care about the radiation dose," said Fletcher Allen radiologist Dr. Christopher Filippi, who helped scan the mummy and develop the new techniques. 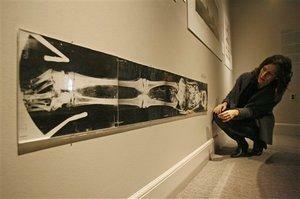 He hopes to present a paper on the techniques at the fall meeting of the Radiological Society of North America. "Normally, in clinical scanning you have to worry about the patient. 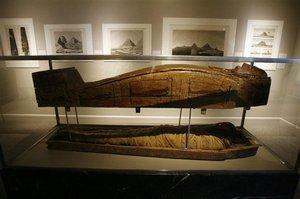 If the person is deceased or a mummy, you can take your time and get exquisite detail." 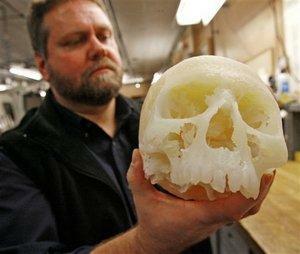 New CT technology is almost 1,000 times faster than 20 years ago, which also helps improve the ability to produce three-dimensional images, such as those used to create the model of the mummy's skull, said Dr. George Ebert, the chief of imaging technology at the Radiology Department at Fletcher Allen. The Fleming Museum acquired the mummy in 1910 after George Perkins, the university's first curator of collections, bought it at a market in Cairo. 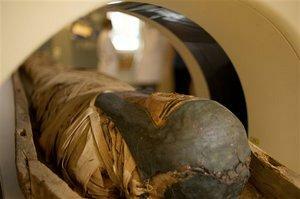 The mummy is believed to be about 2,700 years old and to have come from the Nile Valley, about 350 miles south of Cairo, museum officials say. Since shortly after arriving in Burlington a century ago, the mummy has been displayed at the Fleming, just downhill from the medical complex now known as Fletcher Allen. It's still one of the museum's most popular attractions. "It's not just a body. It's wrapped in linen. It's beautifully wrapped and then painted and then encased in a further decorated tomb," said Fleming Director Janie Cohen. Johnson grew up in Globe, Ariz., where a fifth-grade teacher helped instill in him a fascination with Egyptology, honed by watching "Raiders of the Lost Ark" with his father and learning about archaeological sites in his home state. Early one morning last fall, Johnson and museum staff took the mummy out of its glass display case, protected it in bubble wrap and trundled it the quarter-mile from the museum to the radiology department. They rolled it into a state-of-the-art machine and spent an hour scanning it from every angle. The doctors came away with about 10,000 images, some with a resolution of about one-hundredth of an inch. 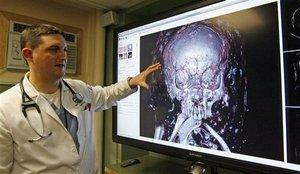 A skull fracture above the right ear stood out. The injury would have been enough to kill her, but no one could say whether it happened before she died or after. There was a cyst above one tooth, and the scans showed that the Egyptian embalmers removed the girl's brain through the base of her skull rather than the more common method of extracting it through the nose. The mummy is back in its museum case and the Fleming staff is planning to build a new exhibit with the information gleaned from the scan, including CT images and the 3-D reconstruction of the girl's skull. What they didn't know was that those same imaging techniques would help play a role in modern forensic medicine. "That's what science is all about," said Sens, the North Dakota pathologist. "Every person's death can mean something. When we examine it carefully it benefits society, it benefits the family and ultimately it benefits everyone."